First of all, Congratulations on this very well deserved achievement. When and what motivated you to embark on this journey of preparing for UPSC? Though I have been socially conscious and always wanted to work with people for betterment of their lives, the idea of taking the path of civils came to me only in 2010 after working for three years in a core electronics company. Though I was doing good in the job, I realized that my passion lies somewhere else and that my potential could be well utilized if I explore other avenues like civils. I used to be under the impression that any work we do, is ultimately serving the nation in one way or the other. But only a few would want to serve the nation truly, directly and with the larger goal of national development in mind. I have always been sure that I could be or at least try to be one among those and so decided to quit my corporate job and started preparing for civils. It isn’t an easy task to prepare for an exam that runs for almost a year. So, what kept you going in this process? True. It needs a lot of motivation to keep going with the preparation. My larger goal of serving the country with the best of my efforts kept me going. Though I started the preparation thinking that civil services is only one of the several ways in serving the country, somewhere down the lane, I came to the conclusion that it is the only way available for me now. Given my personal and family situation, my passion and potential, there isn’t anything else giving me the opportunity to do what I always wanted to. And definitely my family, friends and colleagues at every stage helped me cope up with the tiring process of exam. Think back and tell us about the factors behind your success in UPSC? – The personal interest I took in understanding the processes, institutions and loopholes in the country’s policy making and implementation on ground, particularly helped me in the interview. – Support from friends and family who helped me to tackle the pressure. You have worked with FDR for sometime. Reflect on the ways FDR experience contributed to your achievement? The experience I had at FDR, the intensive discussions with colleagues and most importantly the interactions I had with Dr. JP, taught me lessons for life. The most important lesson I learnt was that – country and its interest should be of utmost importance and one should not do anything that would damage or hamper its journey towards higher development levels. The other lesson is that there has been and there will always be an extra burden on those few good men and women who are honest and high on integrity. These are the lessons I would cherish for life and will try my best to live upto them after joining the service. Other than these, strictly with respect to examination, FDR experience helped me analyse the policies well in a holistic and multidimensional way. The knowledge I gained on electoral processes of the country, its lacunae and the reforms needed helped me very much in the interview. Generally, everyone has a role model to whom they look up to. For someone who is going to be a bureaucrat herself, name two or three top civil servants you see as role models for new entrants like you? Frankly speaking, I do not have ‘a role model’ to whom I look up to for everything. I try to learn different aspects from different people and try and inculcate the same in my personality. I only wish and hope to meet many such people every day who can keep inspiring me to do my best at work. As I already mentioned, I always will look upto Dr JP for inspiration. In addition, I respect all those civil servants who are the victims of political hassles like frequent transfers and yet withstood without giving in to the pressures. What is your vision for India? And, what role do you see yourself playing in it? How will you arm yourself from “the system” putting you in line like all others? I wish to see India to always live up to the democratic principles its founding fathers have laid down years ago. In the process, we should strive to establish robust institutions which will help the best and the brightest, the honest and those who are truly concerned about India, to work towards the country’s progress and not the other way. I envision India where people – their participation and development – is the central concern, with supporting systems to achieve the same. Wherever I go, whatever I do, I shall try and inculcate these ideas into the system at every level. Falling in line will be an option and only option many a times for those who fail to see the larger picture or to those who have a lot to lose if they do not fall in line. For me, if I fall in line with ‘the system’ I will lose the biggest asset I have – myself. Instead, I am going to take shelter in the constitutional and legal safeguards if need be, which is an option hardly civil servants tend to use before giving up. What are your words of advice and caution for aspiring Civil Servants? – It is important to withstand the pressure and tensions which are part of the preparation. While facing failure, it might seem as if the world is crashing in front of you. But no, civils is not the end, it is just a means to contribute your part to the country. There are various avenues and in today’s world multiple opportunities to find one’s interest, passion and accordingly tap one’s potential. – I would sincerely advice those who see civil services strictly as a secured job and a career, to rethink. – The aspirants should enjoy the process, and the enormous amount of learning they get without worrying much about the end result. Committed bureaucrats are the need of the Nation now who can lead India on the path of development defying the odds/obstacles. We are happy to note the same qualities in you. We would like you to be an exceptional bureaucrat who stands firm amidst challenges and build the necessary bridge between politics and bureaucracy to serve the people. 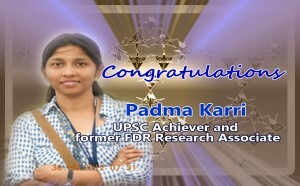 FDR wishes you all the very best for your future endeavors.